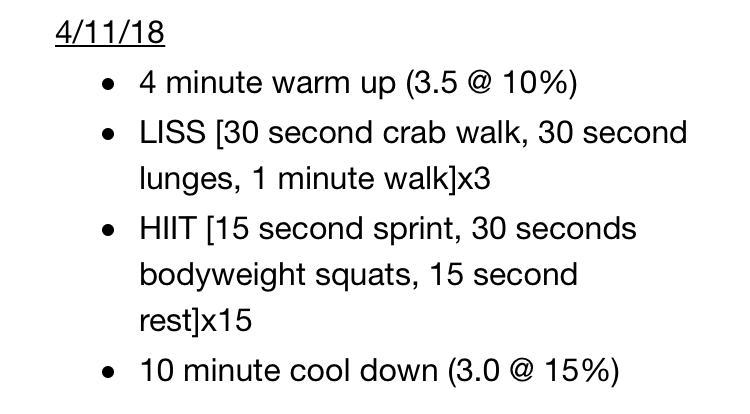 To start off your week on the right foot, I’m sharing a full week’s worth of workouts. 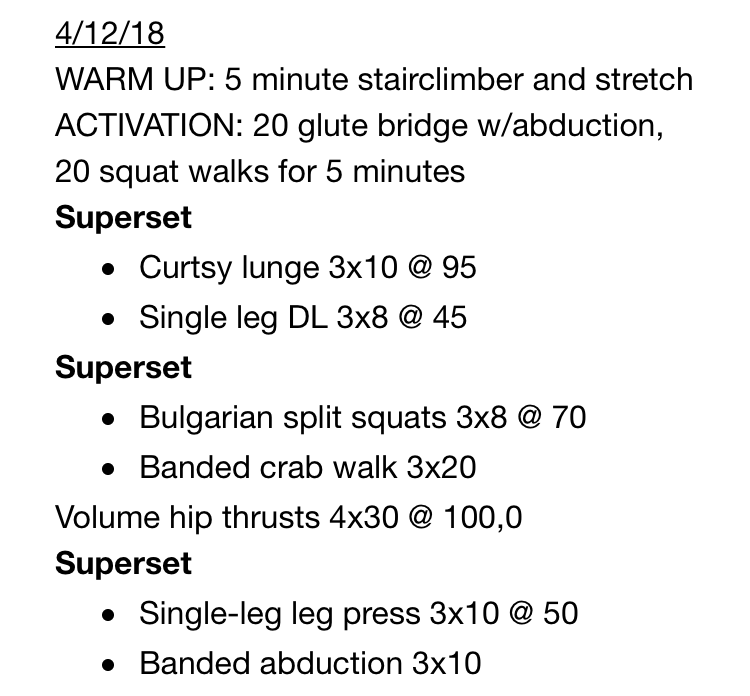 I record all of my workouts using the Evernote app, which makes it really easy to track my progress and build new workouts based on ones I liked in the past. Generally, my workout split is legs (low rep and heavy), push (chest/shoulders/triceps), pull (back/biceps), legs (high rep and lighter), rest. However, I’ve also been throwing a few just-cardio sessions into the mix as well. 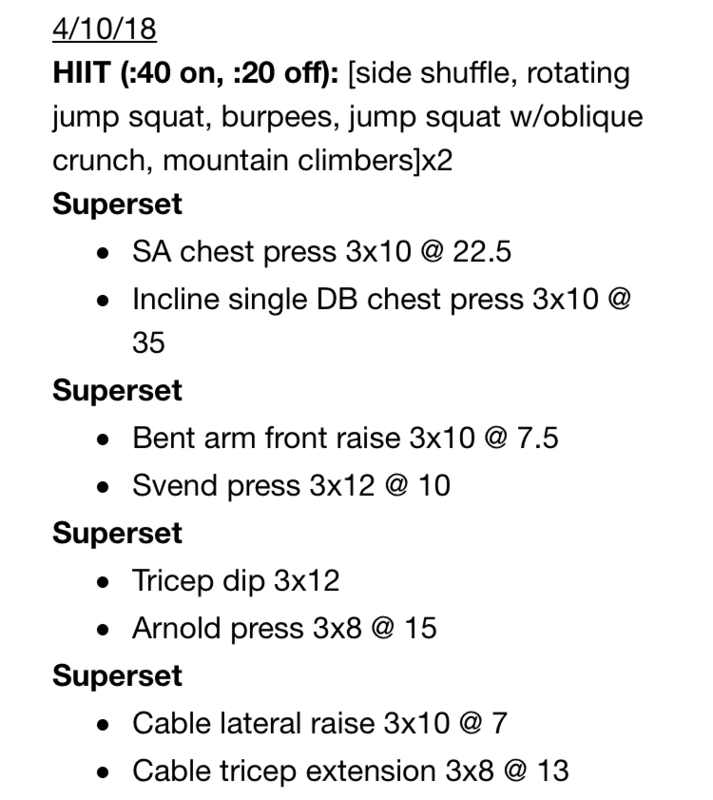 I also typically try to do something ab-related on at least one of those days, and I typically do HIIT circuits on my upper body days as well. I’ve gotten into throwing a longer stairclimber session onto these days. Really fires your legs up, ya know? 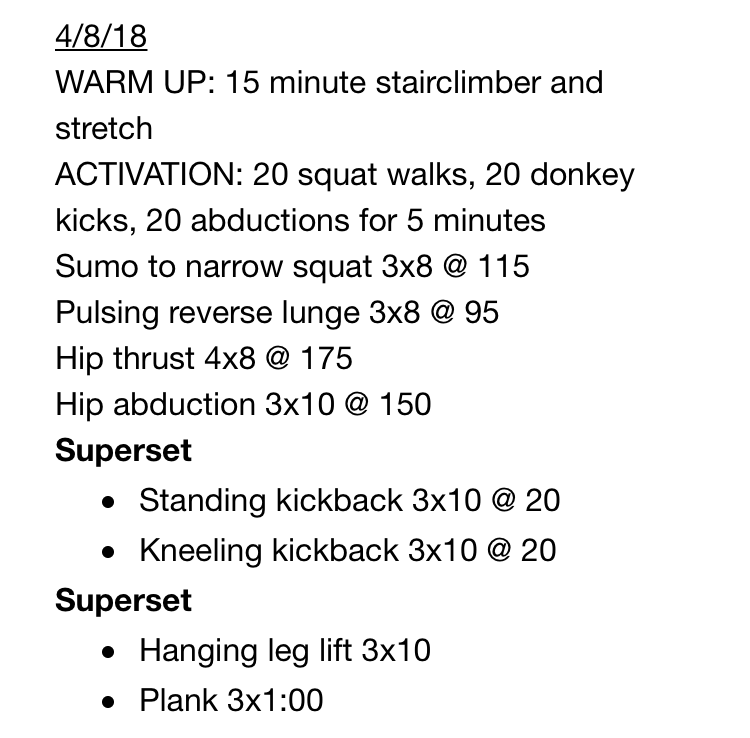 Speaking of firing your legs up, you’ll notice that I have an nice little “activation” section after my warm-up on leg days. Basically, these are bodyweight exercises designed to – you guessed it – activate your glut muscles. If you’re trying to grow your glutes (instead of just your legs), this is a game changer. Also, hip thrusts are on basically every leg workout I do, because while I kind of hate them, they are 100% what I attribute most of my #bootygains to. So one of my big fitness goals at the moment is to be able to do a pull-up. It seems like such a little thing, but I had basically zero upper body strength when I started lifting in November, so being able to lift my entire body using just my back and arm muscles is a big deal. Hence, the assisted pull-ups that are on nearly every pull day workout I do. Also, I’ve gotten weirdly into jumping rope as a warm up? It kinda makes me feel like I’m back in elementary school PE class though, lol. These used to be my least favorite days, but I kind of love them now? My shoulders are probably where I’ve seen the most muscle growth since I started lifting (other than my legs), so I get a lot of joy out of seeing how much my shoulder strength has improved. Also, working chest seems a bit counterintuitive for women, because, you know, our chest muscles are a bit hidden, but I can’t emphasize enough how working chest can give you a nice little “lift” up there, which is a miracle worker if you’re a member of the #ittybittycommittee like me. Little known fact: in freshman and sophomore years of college, I was a huge runner. 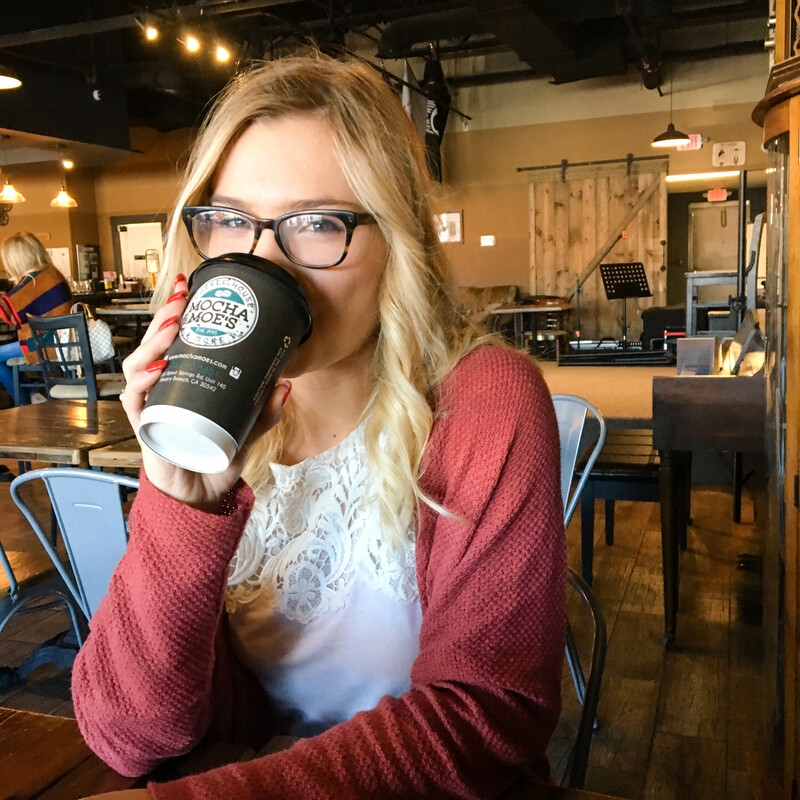 That was my primary form of exercise until I discovered Pure Barre, and I literally ran half marathons for fun. My enthusiasm for cardio has waned a little bit, but I still think it’s a great way to get in a quick workout – I’m particularly fond of HIIT sprints, which get your heart rate up real high but also allow you to rest in between instead of powering through 30 minutes of steady-state running. I have a Hip Circle that is basically my best friend on leg days. I use it for activation, and an an added level of resistance on squats and hip thrusts. On these lighter leg days, I also occasionally use it as the only weight – it’s got a bit more tension than a traditional resistance band, so I promise, your side glutes (aka your gluteus medius) will be feeling it. 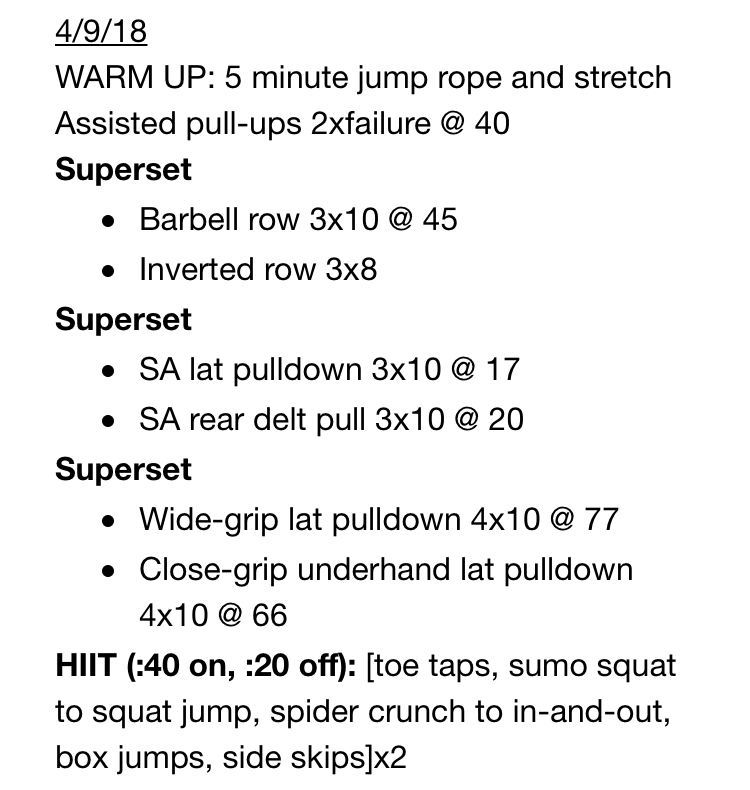 If you have any questions about any of these workouts (or what I mean by certain terminology… sometimes I make up my own words for things when I don’t know the technical name lol), be sure to let me know!